You live in United States and you know how to drive. Or you just move to USA and you are a good driver in your home country. You need a California Driver License and you passed DMV written driving test. You also need to succeed “Behind The Wheel Test” which is more difficult than written test. Written test is kinda easy. If you fail, you can take it and you can work at home, you can read past driving test questions and take sample tests to improve your knowledge. 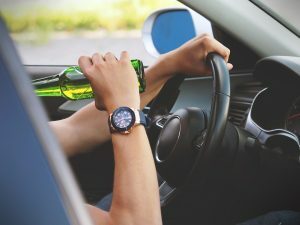 But in United States, driving on the road is a different story and especially in California, some traffic practices might be different than home country or another state of US. So here are some tip and trick for you and top ten mistakes most people do while they are taking DMV California Behind The Wheel Test. Check the blind spot by looking your turning side. If the signal is green and you prepare for left turn, you have to stop before all coming traffic to see whether they are turning or coming straight, wait for the pedestrians to cross. After that you can complete your left turn. So first you have to yield even the light is green and there is no signal for left turn. Don’t worry if you are in the intersection and the light turns red before you complete your turn. You entered legally on green light. So other traffic has to wait for you to clear before they can proceed. In United States, you have to stop completely if you see a “stop” sign as if this is a red light. Even if the intersection empty and there is no pedestrian on the road, you have to “stop” completely. Most drivers also stop on the “limit line” or after they pass the “limit line” a little bit. All those are mistakes that make you fail the test. If there is a school bus on the road and red lights of the school bus are on. In this case whether you are on the same side of the bus or opposite side of the bus, you have to make a complete stop till the “red lights of the bus” go off. 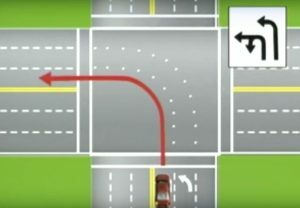 When you have a double left turn lane, you can get into the inside lane or outside lane. When you make a left turn on green light, if you are in the inside lane, you have to end your left turn in the inside lane. 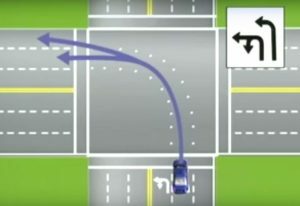 If you are on the outside lane, you can end your left turn in either lane of outside lanes. Most drivers do not their left turn in the same lane they have started. This is one of the common mistakes. You have to obey speed limits always. If the limit is 65 miles per hour, you have to drive at this limit or slower. Sometimes the weather and road conditions force you to drive slower. Otherwise you shouldn’t drive too slow. This may cause congestion in the traffic. 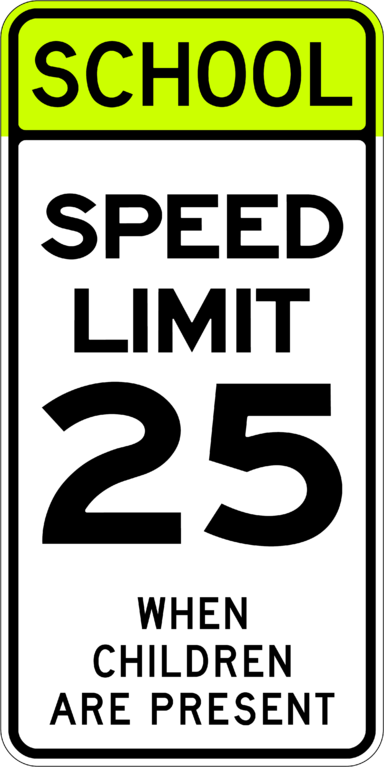 If you are in a school zone and it says “Speed limit 25 when children are present”, this means if kids are around walking in the pedestrian zone, your speed limit is 25. If there is no one then you can drive on the regular speed limit. If you are not experienced enough, you’ll probably fail in the driving test. There are some situations that you can learn by experience not by reading from the books. An ambulance is approaching and you don’t know what to do and you freeze in the car without anything. This will be a good reason for you to fail the test. So practice! Practice! Practice! before entering “Behind The Wheel Test”. If you go to driving test with a borrowed or rental car, probably you don’t know your vehicle’s properties very well. This may cause get excited in the test and make you panic. At the beginning of the test, DMV examiner asks questions about vehicle’s specific items such as how to open trunk or flashlights. For example, it is raining and you don’t how to turn on your windshield wipers. You failed! Know your car before entering the test. You have to scan everywhere during the “Behind The Wheel Test.” If you only look straight ahead and concentrate what is in front of you, yo can miss pedestrians who prepares to cross the street or you can miss the traffic signs. You have to scan sides, mirrors and road always while driving. Some people think that being extra cautious will make them pass the driving test. Caution is good but too much can create traffic hazards. If you overly cautious, you can hesitate while you make your left turn and this may cause confusion on the other drivers. So be assertive and relax! It is not rocket science. Behind the wheel traffic test may take place in an unfamiliar territory that you didn’t drive before. For example, you are in a commercial zone and there is no speed limit sign and you are driving over 40 miles per hour. Big mistake! 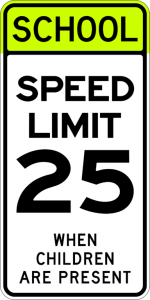 You have to know that if there is no speed limit sign, the limit is 25 miles per hour by default. So it is better to go to the exam area earlier and check the surroundings and make yourself familiar with traffic situations such as roundabouts, traffic signals, speed limits etc. If you want to pass the test, try avoid ten common behind the wheel test mistakes that most applicants do. Otherwise you have to take test many times till you get your driver license.